Sensitization occurs when the antigen makes contact with some part of the body (pollen grains contact the mucous membrane of the nose, for example) and induces a response (figure 18.1a). 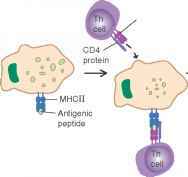 The antigen is taken up, processed by antigen-presenting cells, and presented to T cells. The cytokines they produce acti vate B cells to become antibody-producing cells. Although B cells making any of the classes of immunoglobulin are probably induced to make antibodies, the tissues under the mucous membranes are rich in B cells committed to IgA and IgE production, and IgE-producing cells are more abundant in allergic than in non-allergic individuals. These cells have been switched from making other classes of immunoglobulin to making IgE by the action of cytokines. As IgE is produced in this area, which is rich in mast cells, the IgE molecules attach via their Fc portion to receptors on the mast cells and also on circulating basophils. Once attached, the IgE molecules can survive for many weeks with their reaction sites waiting to interact with antigen. The individual is thereby sensitized to that antigen. Antigen (e.g., pollen grain) is taken up by a macrophage (antigen-presenting cell [APC]) and complexed with MHCII. APC presents antigen to Th cell. Armed Th cell secretes cytokines that drive proliferation and differentiation of B cells to plasma cells. 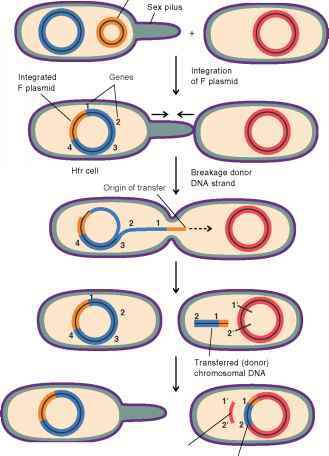 Clones of antibody-producing plasma cells and memory cells are made. IgE antibodies bind to mast cell receptors; the individual is sensitized. Cross-linking of cell-bound IgE causes the mast cell to degranulate. Mediators cause capillary dilation, increased capillary permeability, airway constriction, mucus secretion, pain, and itching. Symptoms occur, leading to asthma, hay fever, anaphylactic shock, etc. Histamine and other mediators are released. Figure 18.1 Mechanisms of Type I Hypersensitivity: Immediate IgE-Mediated (a) First exposure to antigen induces an IgE antibody response leading to sensitization. (b) A reaction is triggered when antigen combines with and cross-links cell-bound IgE on mast cells in a sensitized individual. Mediators the United States. Susceptible people often have higher than normal levels of IgE in the circulation, and increased numbers of eosinophils. Anaphylaxis is the name given to allergic reactions caused by IgE-mediated release of mast cell granules. Although anaphylaxis may be generalized or local, by far the most usual allergic reactions are examples of localized anaphylaxis. Hives (urticaria) is an allergic skin condition characterized by the formation of a wheal and flare; the wheal is an edematous itchy swelling generally resembling a mosquito bite, surrounded by redness, the flare. The wheal and flare reaction is seen also in positive skin tests for allergens (figure 18.2). Hives may occur, for example, when a person allergic to lobster eats some of the seafood. Lobster antigen absorbed from the intestinal tract enters the bloodstream and is carried to tissues such as skin, where it reacts with mast cells that have anti-lobster IgE antibody attached to them. Reaction between antibody and antigen on the mast cell surface releases histamine, which in turn causes dilation of tiny blood vessels and the leaking of plasma into skin tissues. Life-threatening respiratory obstruction is possible dur ing a reaction if there is extensive tissue swelling in the throat and larynx. Because histamine is a major mediator in this situation, the reaction is blocked by antihistamines. Hay fever (allergic rhinitis), marked by itching, teary eyes, sneezing, and runny nose, occurs when allergic persons inhale an antigen such as ragweed pollen to which they are sensitive. The mechanism is similar to that of hives and is also blocked by antihistamines. Asthma is another type of immediate respiratory allergy. Antigen-induced release of chemical mediators from IgE-sensitized mast cell granules and from eosinophils attracted into the area of inflammation causes increased mucus secretion and spasms of the bronchi, markedly interfering with breathing. Mediators other than histamine, mainly lipids such as leukotri-enes and prostaglandins and protein cytokines, are responsible for the bronchospasm and increased mucus production. Antihistamines are therefore not effective in treating asthma, but several other drugs are available to block the reaction, such as bronchodilating drugs that relax constricted muscles and relieve the bronchospasm. An example is albuterol, a bronchodilator usually delivered by an inhaler. Steroids are often used to decrease the inflammatory reaction. An anti-IgE therapy is described later. 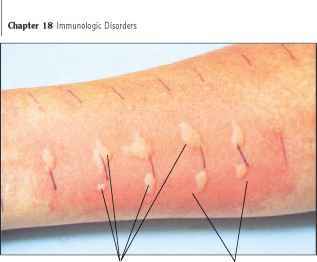 Figure 18.2 The Wheal and Flare Skin Reaction of IgE-Mediated Allergies A variety of antigens are injected or placed in small cuts in the skin to test for sensitivity. Immediate wheal and flare reactions occur with antigens to which the person is sensitive. Generalized systemic anaphylaxis is a rare but serious form of IgE-mediated allergy. This is the form of anaphylaxis described by Richet. Antigen enters the bloodstream and becomes widespread. 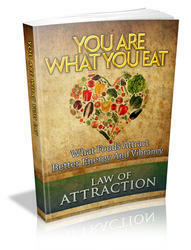 Instead of being localized in areas of the skin or respiratory tract, the reaction affects almost the entire body. Loss of fluid from the blood vessels into tissues causes not only swelling, but also a condition called shock. Shock is a state in which the blood pressure is too low to supply the blood flow required to meet the oxygen needs of vital body tissues. In the case of generalized ana-phylaxis, large amounts of released mediators cause extensive blood vessel dilation and loss of fluid from the blood, so that blood pressure falls dramatically and there is insufficient blood flow to vital organs such as the brain. Anaphylactic reactions may be fatal within minutes. Bee stings, peanuts, and penicillin injections probably account for most cases of generalized anaphylaxis. As mentioned in chapter 16, penicillin molecules are changed in the body to a haptenic form that can react with body proteins. In a small percentage of people, this hapten-protein complex causes the formation of IgE antibodies that react with penicillin. Fortunately, only a tiny fraction of people who make the antibodies are prone to anaphylactic shock. Peanuts and their products, such as peanut oil, are found in so many foods that it is often hard to predict where they will be encountered. The problem is widespread enough that peanuts have been barred by some airlines as a snack during flights. Generalized anaphylaxis can usually be controlled by epinephrine (Adrenalin) injected immediately. Anyone who has had a local allergic reaction to bee sting, penicillin, peanuts, or other substance is at risk of anaphylactic shock if exposed to the same substances and should wear a medical-alert bracelet and carry emergency medications. Immunotherapy is a general term for techniques used to modify the immune system for a favorable effect. For example, one way of preventing immediate hypersensitivity reactions is to inject the person with extremely dilute solutions of the antigen, paradoxical in that even tiny amounts of antigen can risk severe generalized anaphylaxis. This form of immunotherapy is called desensitization or hyposensitization. The concentration of antigen in the injected solution is very gradually increased over a period of months in a series of injections. The individual gradually becomes less and less sensitive to the antigen and may even lose the hypersensitivity entirely. During treatment, there is an increase in the levels of IgG and a decrease in the IgE response to the antigen. The IgG antibodies produced are thought to protect the patient by binding to the offending antigen, thus preventing its attachment to cell-bound IgE (figure 18.3). Another approach is to use antibodies to IgE (anti-IgE) to counteract and remove allergy-causing IgE. However, most IgE molecules are attached to receptors on mast cells and basophils. Injected anti-IgE would bind to IgE attached to cell receptors, causing cross-linking of receptors and massive disastrous mediator release. In order to use this form of immunotherapy, a safe and effective anti-IgE molecule had to be engineered,. A first step was finding the amino acid sequences in the Fc portion of human IgE that bind to the IgE receptor on human cells. Then a monoclonal antibody (Mab) was produced in mouse cells that bound circulating human IgE specifically at that receptor-binding site. This Mab could not react with cell-bound IgE to cause mediator release because the binding site was already blocked by its attachment to cell receptors. Although the Mab blocked the IgE attachment to cells, mouse monoclonal antibodies were not effective in humans for very long because they are foreign molecules and are removed quickly from the body. The next step was to "humanize" the Mab by making a recombinant antibody with the antigen-binding site (anti-IgE) from the mouse Mab and the rest of the molecule from a human antibody. This hybrid recombinant molecule is called rhuMab (recombinant human Monoclonal antibody). RhuMab, also called omalizumab, injections are well tolerated by asthmatic people and are remarkably effective in treating their asthma, reducing their use of more toxic medications. Amounts of free IgE in the circulation of treated people were reduced more than 90%, and IgE-binding sites on mast cells and basophils were greatly reduced. The anti-IgE also bound to IgE-producing B cells, causing apoptosis of these cells and thereby preventing more IgE synthesis. Long-term use and value in treating other hypersensitivities are still being evaluated. What is considered a big wheal or flare?